Avocados, Eggs and Bacon were meant to go together! 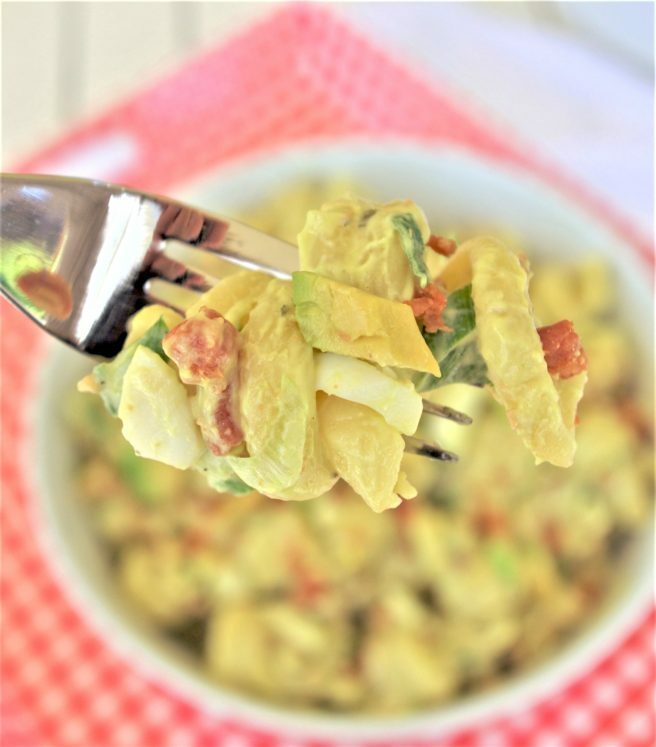 This is the perfect easy and delicious pasta salad side dish. Bring it to 4th of July holiday celebrations, summer cookouts, fall tailgating lunch spreads, potlucks and backyard dinner parties! It tastes amazing immediately and even better after an hour in the fridge! You’re going to love how quick this is to throw together for a last minute side dish. The lime juice slows the avocados from browning as quickly in the fridge! The avocados will turn a really dark green if you chill it overnight – it won’t be as pretty as if you serve it right away, but it will still be delicious! It’s creamy, rich and PACKED with flavor. 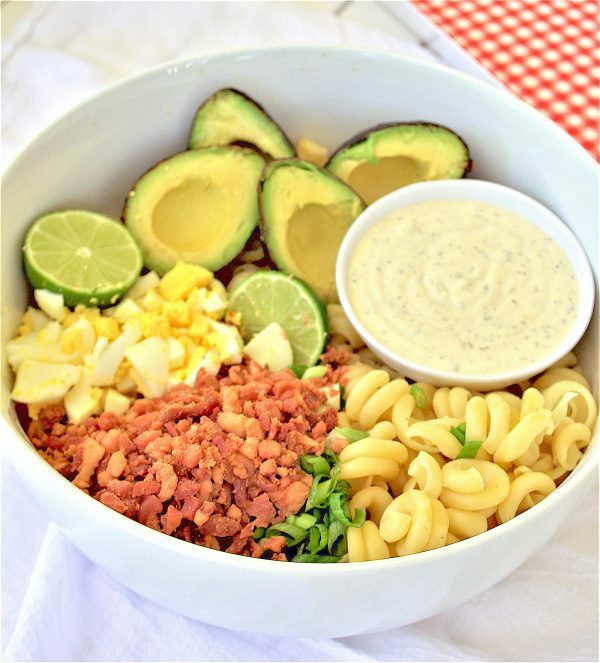 Grab a few simple ingredients and get ready to fall in love with this amazing pasta salad! My favorite way to “boil” eggs is to bake them. It’s super easy and they turn out PERFECTLY every time. I just place each egg separately in the cups in a muffin tin and bake them at 325 degrees for 30 minutes. Transfer them to ice water to soak and cool for a couple minutes and peel! ***Scroll down for the printer friendly (full step by step instructions) version of this crowd favorite pasta salad! Before you scroll down to PRINT the RECIPE – Make sure to PIN THE IMAGE BELOW to find your way back to this EASY and delicious pasta salad recipe! 1 16 ounce package pasta of your choice. My favorite way to "boil" eggs is to bake them. It's super easy and they turn out PERFECTLY every time. I just place each egg separately in the cups in a muffin tin and bake them at 325 degrees for 30 minutes. Transfer them to ice water to soak and cool for a couple minutes, then peel and dice them up! Prepare your pasta according to the package directions. Drain and leave to cool but do not rinse. In a separate small bowl, whisk together the mayonnaise, sour cream, buttermilk ranch powdered mix, the juice of the whole lime and salt and pepper. Add this mixture to the egg and avocado mixture in the large bowl and mix it all together well. Dump in the pasta and gently mix everything together until it's all evenly combined. Sprinkle remaining bacon crumbles and sliced green onions on top. Serve and enjoy! You can cover it to chill in the fridge until the party or serve right away! It's really yummy either way. The avocados will turn a really dark green if you chill it overnight - it won't be as pretty as if you serve it right away, but it will still be delicious! Don’t forget to PIN THIS to your PASTA SALAD FAVORITES board! 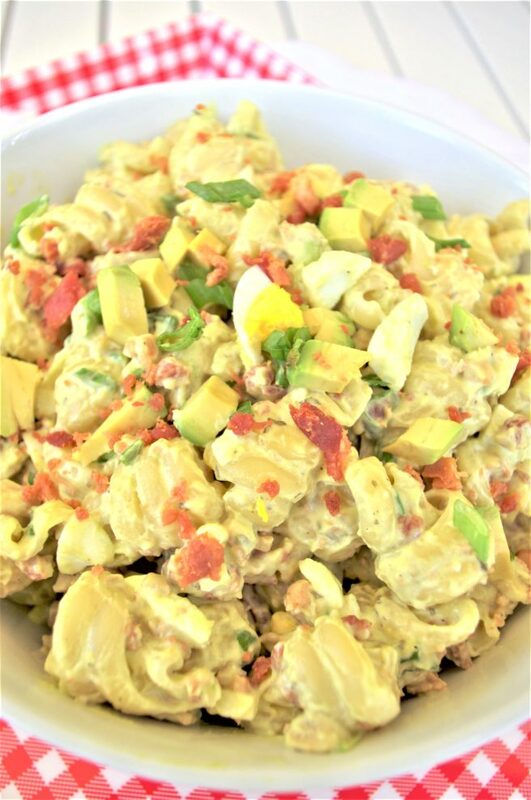 Since you’re in the mood for yummy pasta salads – check out this AMAZING collection of our ALL TIME FAVORITE EASY PASTA SALADS! Just CLICK HERE or on the image below to browse away and save and PIN your new favorite side dishes for potlucks, barbecues and summer backyard cookouts!